Alan Burdock. Why Time Flies: A mostly scientific investigation. 2017. physics, psychology, et cetera of time. Craig Callender. What makes time special? 2017. Unusually deep examination of what we mean by time. Allen Everett and Thomas Roman. Time travel and warp drives: A scientific guide to shortcuts through time and space. 2012. Title says it all. Matthew Jones and Joan Ormrod. Time Travel in Popular Media: Essays on Film, Television, Literature, and Video Games. 2015. Interesting collection of essays. Has a section on Asian Time Travel Films & Television Series. Paul J. Nahin. 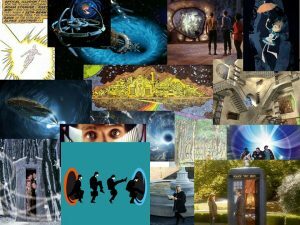 Time Travel Tales: The Science Fiction Adventures and Philosophical Puzzles of Time Travel. 2017. Usual first rate work by Nahin. Fraser A. Sherman. Now and Then We Time Travel. 2017. Very good coverage of film & television. Recommends Aetherco, Epguides, and Wikipedia. All good sources as well. Ryan Wasserman. Paradoxes of Time Travel. 2018. Good review of various paradoxes from a philosophical point of view. David Wittenberg. Time travel: the popular philosophy of narrative. 2013. My favorite as an explanation of what the function of time travel is, from a narrative point of view. 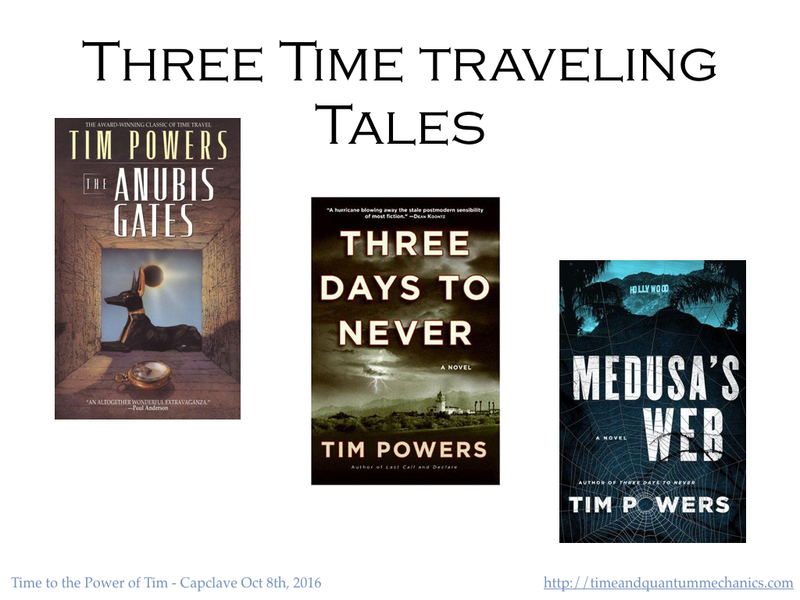 Why do authors use time travel? Today is the official deadline for unsolicited submissions for the Tales from the Miskatonic Library. However Darrell & I have decided to push the deadline back to 8/23, the end of Necronomicon, the Providence convention for all things Lovecraftian. Darrell & I will both be there, and this will give us a chance to meet some of you in person. And the mss are still flooding in! So we want to make sure we have a chance to see everything that’s out there before making the final cut. One question I’ve gotten a lot: is there a maximum length? Well we are only paying 3 cents a word, capped at $100, so that’s about 3333 words. But all that means is if you go over, the payment is capped, we will still look at the story. Really the best length is determined by the story itself. As Lincoln said once, a man’s legs should reach just far enough to get to the ground, more than that is a waste of leg. Same for stories: if they are good, they have a natural length of their own. If you start when things are just getting interesting and keep going till it is clear what the final shape of the narrative is, wasting no time between, the length will tend to be about right. After you’ve cut the story first by a half. And then — and this will hurt — squeezed out another 25% of what is left. But stick to point of view, in a short story there isn’t much time for anything but what happens & then what our hero or heroine did about that! You’ve no time for backstory: if our narrator has had a troubled past (& that is pretty likely in this case) it will show in how he or she responds to events, maybe a bit too fast to leap to conclusion X, a bit over sensitive to casual remark Y. And if it doesn’t show in his or her responses, why does it matter? Leave history to the historians! And you have no time for fore-shadowing, for what is to come, it will be here soon enough, why trouble the already anxious reader? There is only time to show what is happening now! And in fact things are happening so quickly in your narrative — there is so much now now! — that you can barely relay a fraction of them to your reader! You’re like a tour guide where the boat, car, motorized book cart, flying carpet, night gaunt, is going so fast you can only report one or two of the most salient details — the eyes reflected off what had seemed a bit of waste paper, the curious omission in the alphabetized records for Z, the orchid giving a cheerful wave as you pass by — before the next incident commands attention. Not so quickly that the reader loses the thread of course — and therein lies the art. So by the grace of ye eds, another two weeks. Spend the golden seconds wisely! Write, read, revise, reread, rewrite, & submit! Good story — pulls you in from first sentence. Gives you something to think about — leaves you going hmm after the last sentence. Fits into an anthology called Tales from the Miskatonic Library — without taking two pages of explanation by ye eds. And speaking of Balticon, several Balticons back, I mentioned to my old friend Darrell Schweitzer (looks a bit like the Emperor Palpatine but is significantly less evil), that I had been thinking of a story about the Miskatonic University Library to be called Unclassified Horrors. I have always been fascinated by Libraries in general & by the Miskatonic University Library in particular. This is the place where the hero/victim of a Lovecraftian story will go to check out/steal/examine furtively an obscure but dangerous tome. This is a particularly poor idea if you can’t break yourself of the habit of reading aloud. See for instance the unfortunate consequences experienced by Evelyn Carnahan (“I … am a Librarian!”) in the 1999 film The Mummy. She reads from the Book of the Dead. Aloud. And awakens the High Priest Imhotep, whom being buried alive for the last three thousand two hundred and thirteen years has not put in a good mood. Difficulties ensue. And the world is saved only by the pluck & luck of a few bold adventurers. But I digress, something that happens to me a lot in libraries. That is actually a design goal of libraries, think of them as an early form of the Intertubes, where when you go in you are planning to swot up on topic A and find yourself well among the Z’s or even On Beyond Zebra before you know. They deliberately arrange the cataloging systems so that interesting volumes will tend to be right next to target volumes. What you think of as chance is in fact as so often a sinister plot: the very scheme intended to create the illusion of order is meant to pull you in & leave you helpless & browsing on the floor when the final gong is rung & the library scraping machine comes by to scoop up the day’s victims. As you slowly sort yourself out of the pile of your fellow victims at the back of the library, you may wonder how this happened — yet again! It’s the fault of the Dewey Decimal System. One of the innovations of the Dewey Decimal system was that of positioning books on the shelves in relation to other books on similar topics. That’s the problem right there: we are naturally associative thinkers; this well-intentioned positioning of topics near similar topics has the effect on the inquisitive mind of those elvish lights in Mirkwood that lure Bilbo & the dwarves into the spider’s lair (name World Wide Web a coincidence, I think not). Section 216, good and evil, is left just hanging there, with the obvious follow-up section completely, mysteriously AWOL. Where did it go? Why is it missing? This question has plagued people for years. Did Nietzsche have something to do with this? Are his attempts to go beyond good & evil, to explore Section 217, what led to his almost Lovecraftian madness? And when I brought these & similar too-dangerous-to-commit-to-print questions up to Darrell he said — like all editor/writer/booksellers he can resist anything but a chance to make money — ah, the perfect idea for an anthology. And thus Tales from the Miskatonic University Library was born. Surely if we present this as fiction, we will be safe from the attentions of the things that haunt the stacks. But of this more in a subsequent post. Or, less poetically, I have (finally) finished checking the calculations in my dissertation. The checked version is up & I hope to have it uploaded to the physics archive by the end of the weekend.